Managing a PC refurbishment process is a serious challenge. Getting it right requires a series of precise steps. Unlike computer manufacturing, refurbishing can bring its own chaos: incoming parts from anywhere in the world, the unknown impact on those parts environmentally, user fatigue, unqualified for sustainability, just to name a few. “How do I get that PC wrapped clean and ready for trade or retail”, comes to mind. From asset pre-test, OS and image deployment, Microsoft COA management, to final inspection, computers need to be tested. Knowing the condition of the hardware, and its quality, is paramount for any refurbished device. Anything less, loses customer confidence on delivery. Testing ensures you don’t end up getting returns or recycling what you can repurpose instead. PC Builder gives you complete recording of incoming and outbound parts, fully tested, ready for resale. With a few clicks of PC Builder’s tools and applications, your refurbishing processes are automatically deployed, recording everything you test. PC Builder provides a comprehensive, integrated framework of diagnostic applications, image deployment, even hard drive erasure servicing. It’s all built around its dedicated database, achieving automated production processes with clear report structure, giving you reliable test verification. PC Builder is not new, but its benefits may be to you. Since 2001, one or more of the PC Builder Test Suite has assisted commercial PCs worldwide. PC Builder automatically executes diagnostics, erases hard drive data, flashes BIOS, deploys images, and manages Microsoft COAs. Test, track and trace production and distribution. Add in Microsoft MAR engineering services, and your refurbishing is well underway. Computer refurbishment is a rapidly expanding industry sector. Successful computer refurbishers share a common goal: to quickly assess assets and deliver working PCs to their customers. Managing PC refurbishment with production processes is a serious challenge. Getting it right requires a series of precise steps. Your customers demand results. They expect you to find, repair, replace, and keep faulty hardware from falling into their hands. With ever more regulation, and industry standard changes, Computer Refurbishers face significant challenges every day, all while trying to maintain a competitive advantage. Supplying quality products is a key differentiator. Quickly identify faulty components, determine what can and cannot be reused, maintaining a full inventory of quality parts and systems. Have flexibility to manage highly, variable through-put of computers. Accurately record and report Microsoft DPKs and COA. Applying a Windows® 10 operating system, recording the Certificate of Authentication (COA) details, and the computers’ configuration the operating system is locked to, can be a manual and time consuming process. Not only that, the process has many opportunities for mistakes to be made that can lead to stock wastage, inaccurate reporting and penalties. 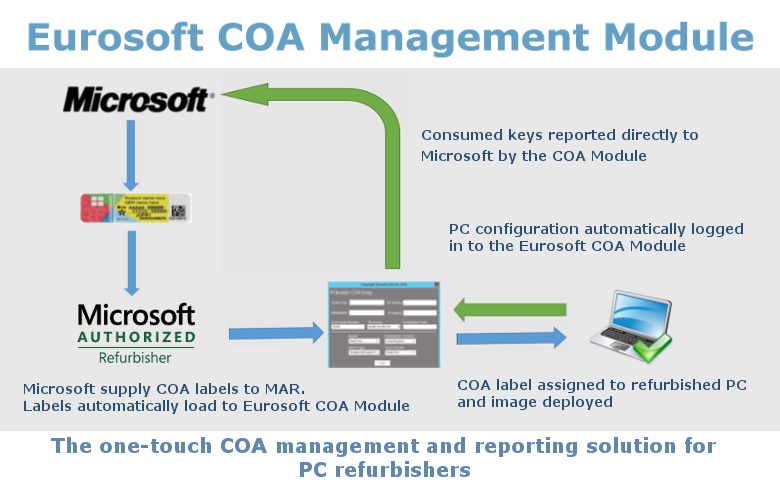 With the Eurosoft COA Management Module, PC Refurbishers can easily manage, assign and report COA usage to Microsoft directly – without spreadsheets. Simple import routine of COA information. No need to rely on saving information to USB flash drives to save COA and PC configuration details. Automatically assign COAs to units and capture PC configurations for Microsoft reports. No more maintaining and consolidating multiple spreadsheets from Third Party Installers (TPI). Monitor precise inventory levels and locations of all program COAs. Send reports to Microsoft at the click of a button. Unlike ERP and shop floor control systems, PC Builder™ is an automated one-touch process management framework for controlling all of your computer refurbishment processes. Including computer hardware testing, hard drive data wiping, image deployment, and results tracking. PC Builder runs on several units under test, automatically executing tests and process scripts for just one or thousands of computers. PC Builder addresses key areas of refurbishing including labour skill, inventory management, configuration control and management, scalability, and repeatability. Eurosoft provide proprietary testing solutions for Intel-compatible or PC hardware platforms – including the latest UEFI. Software environments that typically use Microsoft Windows are catered for, WinPE conveniently utilized too. Imaging, created and deployed with the advantage of Microsoft tools. Uniquely, we also combine direct, auto-booting tests, unattended testing and data erasure tools, going direct to hardware to get around operating systems such as Linux. Improve processes with full factory automation. From receiving recovered assets, right through to final inspection PC Builder efficiently controls your refurbishing processes, saving process time. Provide industry leading hardware testing, not only stressing in the operating systems, but each part is tested independently so you find out fast which parts may not make it to a refurbished system in advance of imaging or final checks. Pre-defined test scripts ensure consistent repeatable testing. Conveniently launch data erasure tools to fully destruct hard drive data. Compliances are fully catered to, including unique erasure certificates for tighter security records. Take control of imaging, storing and deploying images by customer, trade or retail. BIOS flashing aligns with configurations too as do Microsoft COA’s.